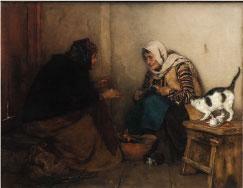 Two works in the A. G. Leventis Foundation Collection are genre scenes: Visit to the Veterinarian, an oil study for the painting Examination of Dogs, Gyzis’ contribution to the exhibition organised by the Munich Academy in 1870 in support of the Franco-Prussian War victims, and Neighbours, which on the basis of stylistic characteristics may be dated to the 1880s. This is a composition featuring two figures, seen from up close and placed within a shallow, sparse home interior. The simple subject – two elderly women chatting while making coffee – is rendered with realism and immediacy. The light energises the painted surface, binding together the composition into a whole. The scene maintains the narrative quality that gradually receded from Gyzis’ work during this period, as he moved steadily towards more complex spiritual pursuits, reflected in his idealistic works. Other works in the Collection belong to the latter group, such as Echo and Nymph and Eros, as well as the personification of Harmony, incarnated by a female figure in profile, holding a lyre, a reference to Gyzis’ great passion, music. As a young child, he began to attend lectures at the National Technical University in Athens, in which he officially enrolled in 1854. On scholarship from the Evangelistria Foundation of Tinos, he left for Munich in 1865 to study at the Academy of Fine Arts. In 1872 he returned to Greece for two years, in the meantime travelling to Asia Minor. 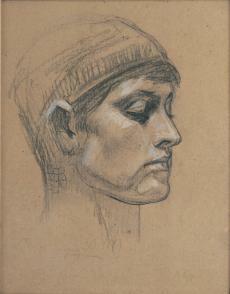 He returned to Munich permanently and regularly showed at the Glaspalast exhibitions. He received the bronze medal at the Paris Exposition Universelle in 1878. In 1880 he became an honorary member of the Munich Academy and from 1882 he taught there as a professor. In 1895 he made his last journey to Greece. He painted the ceiling of the Museum of Decorative Arts in Kaiserslautern (1878-1880), as well as The Apotheosis of Bavaria for the Nuremberg Museum (1895-1899). 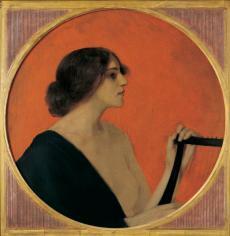 In 1901 a posthumous exhibition was held at the Glaspalast as a tribute to the painters Leibl, Böcklin and Gyzis. In 1928, the Art Lovers Society in Athens held a retrospective exhibition of his work at the Iliou Melathron (Schliemann’s mansion). A towering figure of the School of Munich, he produced a body of high-quality work of great diversity – from genre scenes to portraits to still-life paintings – where the realistic description does not rule out idealistic treatment. His allegories and large-scale religious visions established him as the herald of a new spirit, the precursor of Jugendstil, to which his involvement with the art poster belongs.